Traditional mini dirndl in blue print optics. Colour navy and berry. From Marjo. Simple. Straight. Clear strict form. These are the salient attributes of this traditional expressive dirndl. 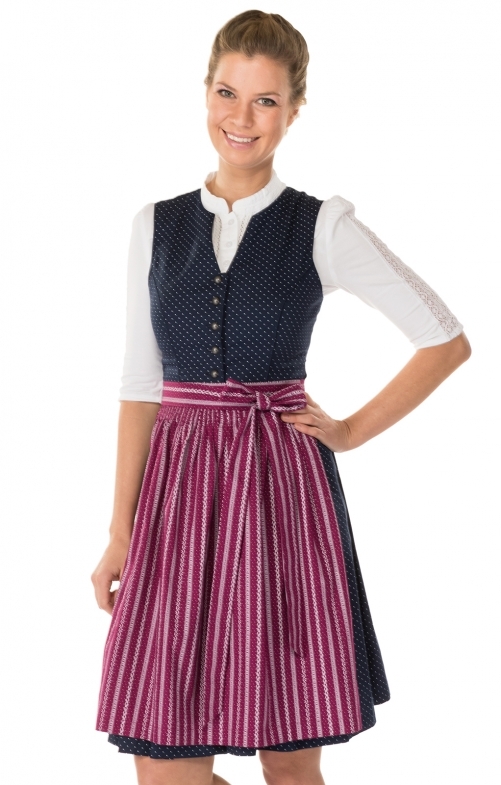 The mini dirndl in the 58 cm skirt length is classified as young and fresh. It is precisely this contrast that makes it so special with this miniature headlamp. The outer fabric is worked with fine modified flowers. The bodice is high-necked. The semicircular metal buttons fit perfectly with the simple shape of this mini headband. The apron is also worked in traditional edging pattern and stands in fresh contrast with the colour berry.